A mockup for a Deep Space Habitat, something that would make lengthy space missions much more comfortable on the astronauts is being put together by NASA at the Marshall Space Flight Center and the Johnson Space Center in Houston. 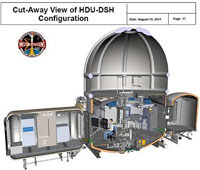 The DSH prototype that NASA is currently working on is only a model, but it will give NASA an idea of how everything will come together on the real thing, which will help them decide on the size, form and equipment. The utilities currently include the obvious life support and food storage, but also a greenhouse for astronauts to grow their own food and 3D printer that will let them create necessary tools on the spot. This is all being pieced together from spare parts of the International Space Station with some museum exhibits thrown in. The goal that NASA has in mind for the prototype is a human mission to an asteroid near Mars, 277,000 miles away from Earth. If that's successful, vessels similar to the Habitat could be used as jump-off points for future human missions, making it easier to travel farther into space.